While the newly announced 9-7 inch iPad can be ordered from Apple's online store on Friday, users wanting to purchase it in Apple Retail stores or other large electronics stores will need to wait until "next week," according to Apple. Apple has provided a bit more information on the new iPad shopping situation. Orders placed on Friday, the first day of availability, will arrive the following week at some point, with no specific day given. Additionally, the same timetable has been given for Apple Store availability. Big box retailers like Best Buy and Target have informed AppleInsider that they are expecting stock in stores at some point in the beginning of April, with orders starting on Friday, the same as the Apple online store. It is not certain why a specific timetable has not been given for availability. The larger-scale iPhone rollouts generally have the first wave shipped directly from China — but where early 2017 iPad adopters will have their orders fulfilled from is not yet clear. 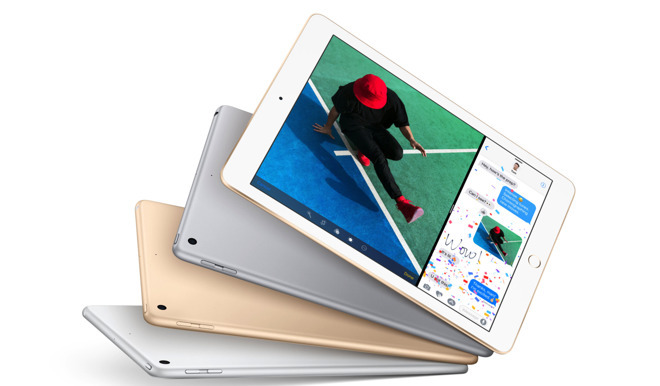 Apple's new iPad announced on Tuesday returns to the iPad Air's thickness and includes a non-laminated Retina Display and larger battery than the iPad Air 2. An A9 processor drives the new unit, with 32GB of device storage — all available for $329 to start. Also on Tuesday, Apple revealed a special edition (Product)Red iPhone 7, the doubling of storage on the iPhone SE without changing the price of the device, and a new Clips app for social media video generation. For up-to-date product availability on Apple's new selection of 9.7-inch iPads, check out the AppleInsider 2017 iPad Price Guide.